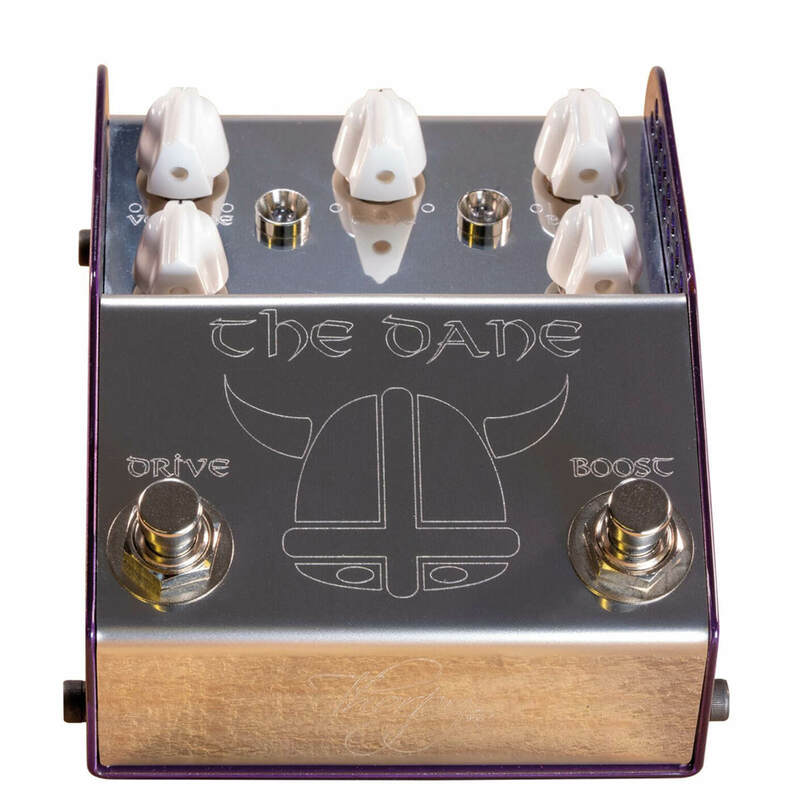 For a moment there we thought Adrian Thorpe had gone all Shakespearean on us, but it turns out the Dane giving his name to this overdrive pedal isn’t Hamlet – it’s session player and Andertons YouTube star Peter Honoré. To be fair to ‘Danish Pete’, he’s also toured with everyone from Lionel Richie to Girls Aloud, and certainly has the chops to merit this signature model. The Dane is a dual-stomper with overdrive on one side and clean boost on the other – an increasingly popular arrangement. You can’t switch the order – it’s boost into OD no matter what – but you do get Thorpy’s usual military-grade solidity and weight, and a gorgeous purple outer shell that’s matched (near enough) by the blueish glow of both status LEDs. The engraved markings are a little tricky to read, as ever, but we’re used to that quirk by now – and it’s not hard to remember what five knobs do. Speaking of which, it’s the usual volume, drive and tone for the overdrive, while the two dials on the right control the level and low-end content of the boost. To boost, or not to boost? That is the question. Well, let’s have a look at the sample settings in the manual and see. 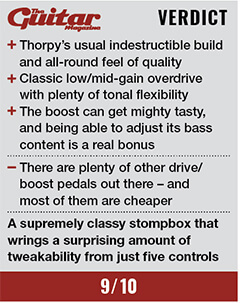 There are six, but it’s the last two – one with moderate overdrive, the other identical but with a dash of boost added – that really show off the essence of this pedal as a verse/chorus/solo gain-hopper. The sound of the overdrive alone is essentially transparent and amp-like, with lots of organic warmth and minimal flattening out of playing dynamics. It’s full without getting too bloomy even on neck humbuckers, and the tone control – just about neutral at halfway – will easily guide whatever pickups you’re using to their sweetest spot. There’s no decibel figure stated for the boost but it’s pretty powerful. With ‘lows’ at halfway we’re still in more or less uncoloured territory, but whack it down to minimum and it becomes more like a Vox Top Boost effect, with cutting treble coming to the fore as the meat of the tone is thinned out. Crank that knob to full, on the other hand, and the bottom end gets massive – this can sound downright awesome as long as your amp has the headroom to do it justice. The fun really kicks off with both overdrive and boost engaged, for a sound that screams ‘classic rock’ even if you’re playing Aphex Twin covers in a ceilidh band. Dynamics still sound open and natural, and you can get a softer, sweeter but no less musical version of that stadium-ready tone just by backing off your guitar volume to around halfway. Considering it only has five knobs and two footswitches, there’s really not a lot that this thing can’t do.